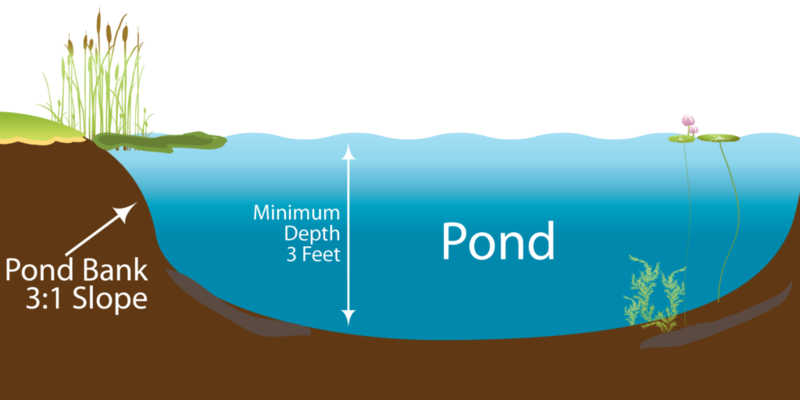 Water depth is an important characteristic to consider when building a pond. Generally, the deeper the pond and the steeper the grade, the better. The deeper the water in the pond, the less sunlight will reach the bottom of the pond. If pond weeds can’t get enough sunlight, they will grow much slower and sometimes not at all. Once a pond is around 8 to 10 feet deep, the weeds will be less likely to flourish. If your pond is shallower than 8 ft, do not expect miracles from our treatments, as shallow ponds are significantly more difficult to manage. We do see shallow ponds make immense progress under our program, but the shallow water does make treatment more difficult nonetheless. The deep water of a pond also allows water to remain cooler throughout the summer months. Having most of a ponds depth between 10-12 feet is ideal. The ideal average water depth is 8 feet. Some people love beach areas. Just make sure you are prepared to see inevitable weed growth along the beach. Sand and small pebbles are a favored spot for weeds due to the ease of spreading, as opposed to between large rocks. Shallow areas are also highly likely to have persistent growth. Remember, the deeper the pond, the less weed and algae problems you will have. If you know you have a more shallow pond, be aware that it may require more attention. We would suggest at the very least our silver plan, but most likely our gold plan, given that our bronze plan does not cover weed treatment.